For more than a year, ER has invested into a greater-Manila community with the goal of helping empower women – and entire families – so they can live sustainable and fulfilling lives. After extensive research, interviews and analysis, our staff and volunteers have been pouring into the community in several ways. Now we can share an exciting highlight. 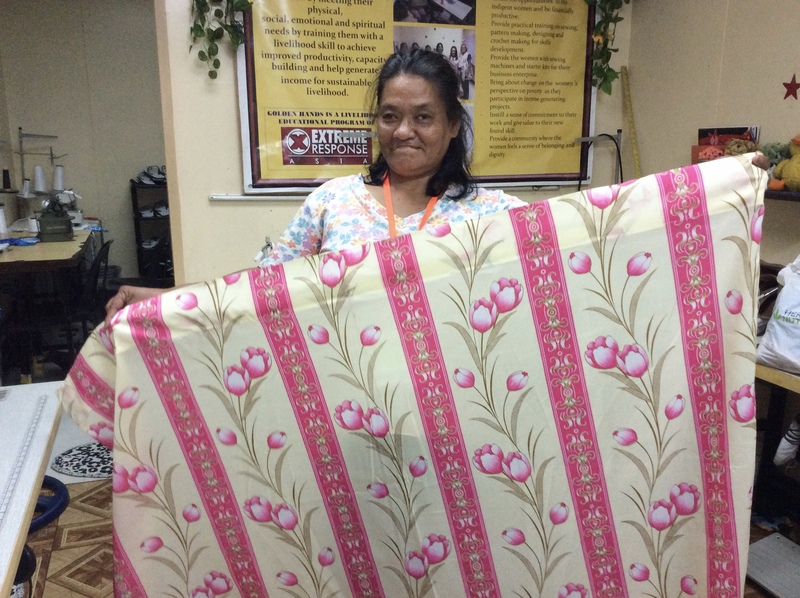 In late March, 13 women graduated from the first Sewing and Pattern Making Class offered by Pathway For Hope in conjunction with ER’s Golden Hands Livelihood Educational program. The 13 women attended weekly classes for six months in order to graduate from the course. The course is demanding and the women must persevere to complete it. 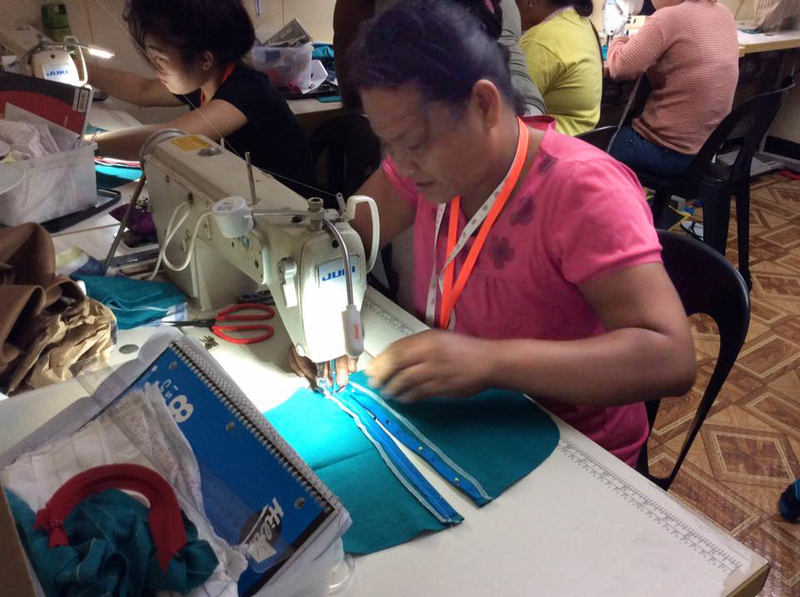 As they learn sewing skills, participants must make several items such as aprons, handbags, and apparel in order to graduate. For those who complete the course, a graduation ceremony recognizes their efforts. The graduates walk a “runway” wearing a garment they have personally made. Then they are presented with flowers, a starter sewing kits, and a sewing machine. This is a magical moment for many of the women who are not used to such rewards. But perhaps greater than those rewards, the women are showered with praise for their hard work and determination. For many, this strengthens their self-confidence and helps strengthen their desire to start or join a sewing business. Scroll below to learn more about Pathway For Hope or click here. ER is pleased to announce the launch of a new community development program that will focus on helping women and families extricate themselves from economic hardship, low education and a lack of opportunity. 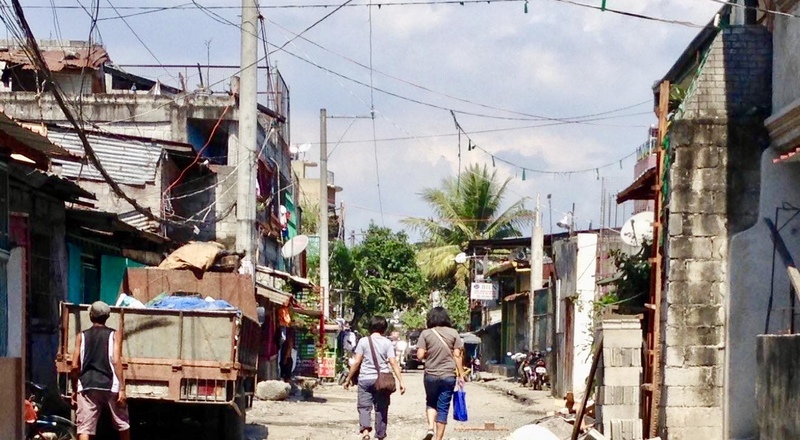 The program is called Pathway For Hope and seeks to provide a community in Manila, Philippines, with “holistic opportunities for people’s empowerment”. Pathway For Hope is launching with support of a a church in California, which is working with ER in order to have a longer-term, deeper impact for a community identified as a good candidate for the program. The church plans to send short-term volunteers to work in the program for the next several years. Currently, ER staff members and volunteers are working on the ground to study the community’s culture and shared interests, assess needs and identify dreams and strategies to help move them forward. Goals for the program include growth and expansion, positive change and transformed lives. Among the sites being assessed includes a flood-prone is a former dump site with substandard housing. Once the assessment is completed, a strategic plan will be finalized this spring with the goal of providing services this summer. One concept under consideration is to launch a resource center to provide skills training, workshops, seminars, focus groups and credit-based education. 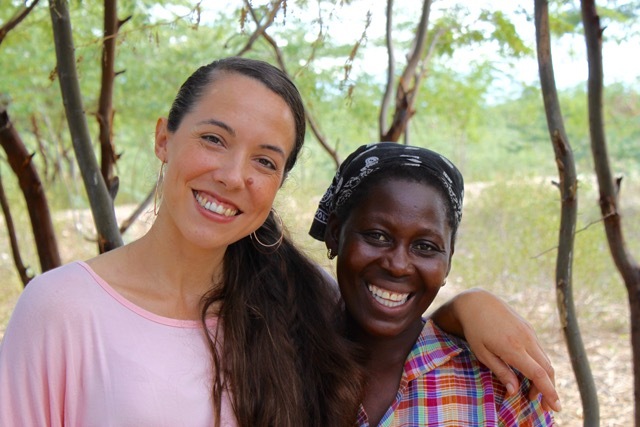 Interested in learning more about ER’s commitment to Women’s Empowerment? Click here to visit our dedicated site: The Empower Fund. And, watch this ER blog for ongoing updates. (Jan. 1, 2018) The following story is one of ER’s Empowering Women blogs that highlight the journeys of women overcoming extreme circumstances to become successful leaders in their families and communities. Adline is the mother of six children ages 16, 13, 11, 7, 3 and 8 months. With ER’s Krischelle Frost interpreting Haitian Creole into English, we learned how Adline is working hard to help her family break free from generational poverty. Before working for ER partner Lemuel, Adline’s life was a daily struggle. Her husband, a farmer in the desperately dry western plateau area of Haiti, told her they would have to move to the city because they were unable to fully provide for their family’s welfare where they live. She came to Lemuel twice to ask if there was any work before receiving a job in October 2017. She works in the agricultural section of the campus where they are growing trees to help expand the “green oasis” Lemuel is creating in the community. Read how planting trees is revitalizing Haiti’s western plateau. Adline shared that Lemuel’s impact on her children has been profound. One of the ways she can see a difference is in her first son. “He wasn’t able to come to school right away. He’s 16 now and he’s delayed in his education because he wasn’t able to get the start my other kids have received. The others have experienced great progress because of their early start. Adline said the family is so committed to her kids’ education that she and her husband purchased a small plot of land closer to Lemuel and plan to build a house. Currently, the kids have to walk about an hour to Lemuel and pass through a big ravine. When it rains in the mountains the water comes down pretty quickly. Adline said she is always nervous that the kids won’t be able to get home from school when the water comes down and floods the ravine. With the educational support they receive at Lemuel, Adline’s family has hope for a bright future. Learn more about Lemuel here and check out the Lemuel blog here. (Nov. 16, 2017) The following story is one of ER’s Empowering Women blogs that highlight the journeys of women overcoming extreme circumstances to become successful leaders in their families and communities. Early in 2017, an ER outreach team found 46-year-old Gina Tublog selling candies and cigarettes on the sidewalk from her wheelchair. Anne Benevidez, director of ER’s Golden Hands Livelihood Educational program, had met Gina many years prior to her accident, before she was disabled. 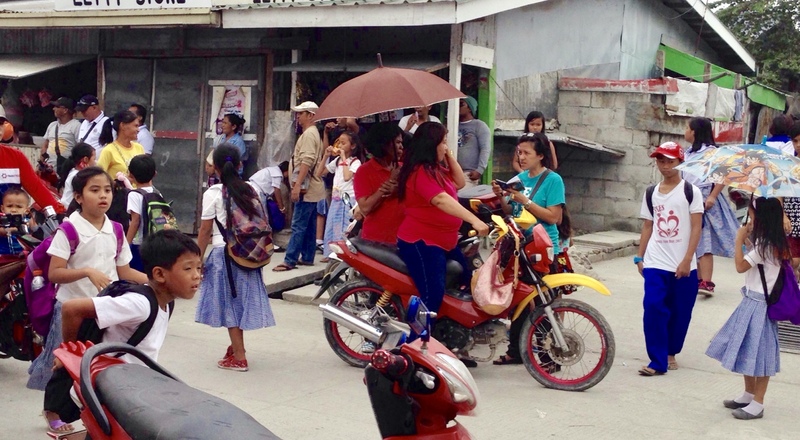 Now, years later, Anne encountered Gina during one of ER Asia’s community outreaches. Gina had been hit by a jeepney during a storm and flood in Manila. The large bus-like vehicles transport passengers through the crowded streets of Manila and can be dangerous for those working in the streets. The accident left Gina unable to walk. Since then her life has been an incredible struggle. Married and a mother of four children, the family is homeless and works on the streets to survive. Her husband drives a pedicab, their main source of income, but it is not enough to afford a home. Her kids are ages 13, 11, 9 and 4. “Physical disabilities are not a hindrance for someone to learn a new skill,” Anne said. “I have seen this in the life of Gina, a mother who lives on the street with her family. I previously met Gina before she became disabled, a long time in the past. But when I saw her again, she was sitting on an old wheelchair. 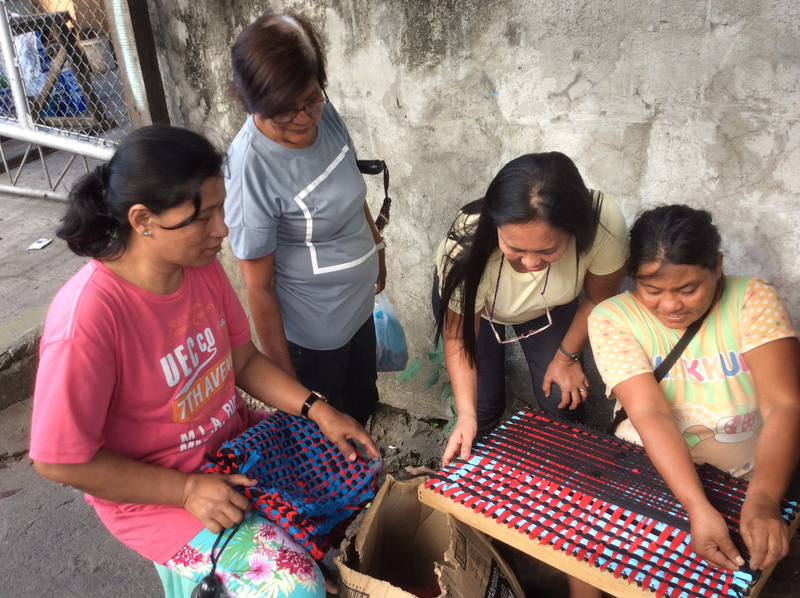 “Following our community outreach in January of 2017, Gina joined us as we were teaching some women living on the street how to make round rags and how to weave rags. She became interested in learning to weave, so we gave her some materials and fabrics. “After some time, Gina was making colorful rags. We were so encouraged by her diligence and determination as she weaved rags under a mango tree. 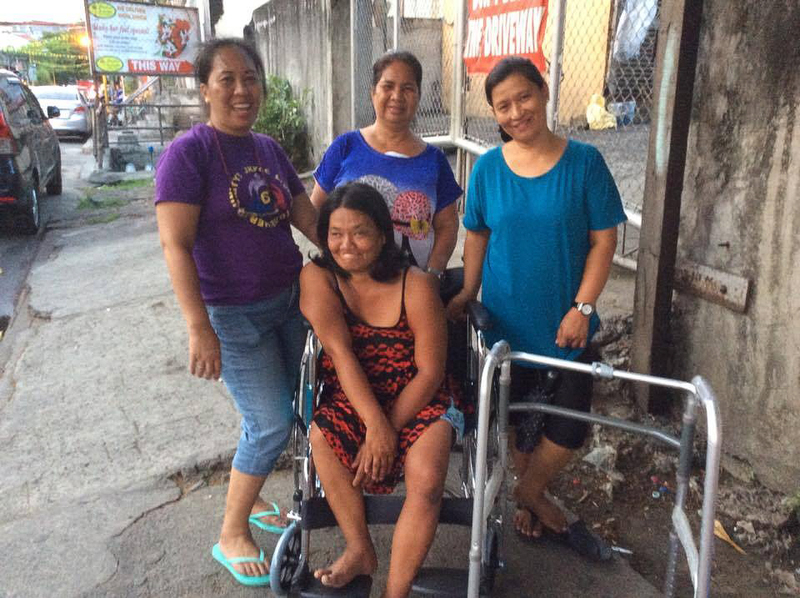 “To reward her determination, we gave her a brand new wheelchair and a walker so she could stand andwalk using her right foot. She was teary eyed when our Golden Hands group surprised her with the gifts. The gifts made her even more encouraged to weave the colorful rags. “Gina did not just learned how to weave rags, but is able to sell them. Because she was weaving on the street many people saw what she was making and they started to order rags from her. She now has established regular customers and a lot of people are still ordering from her. The demand is high that she can’t even supply all of them anymore! Next March, Gina will join the other program participants as they graduate. They will make their own dresses for graduation ceremony and receive a certificate of completion and a new sewing machine. This will allow her to generate income for her family. Until then, Gina also is hoping family can save enough to rent a small home. Currently, the family is squatting on a privately owned space without a roof and they can be evicted at any time. Gina dreams she will be able to send all her kids to school and have a safe place to stay for her family. ER welcomes volunteers and donors who want to volunteer with us or provide scholarships for women like Gina. (Dec. 8, 2017)The following story is one of ER’s Empowering Women blogs that highlight the journeys of women overcoming extreme circumstances to become successful leaders in their families and communities. For some parents, handling even one child is a major challenge. Imagine being a mom to 80 kids at the same time! 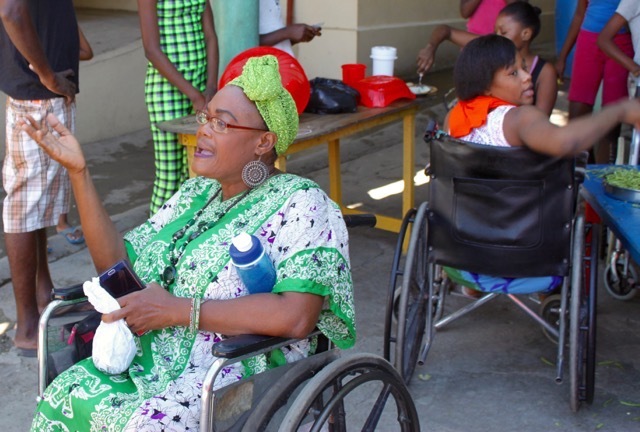 That’s the role of Linda Felix (pictured above wearing hat) at House of Hope (HOH) in La Pointe, Haiti. Sure, Linda gets help from staff. But still, overseeing daily operations for so many kids is a Herculean task. Actually, Linda has mothered way more than 80 kids. She first came to work at HOH in 1980 before assuming the director role in 1988. In her 37 years on staff, thousands of kids have passed through this children’s home. At any any given time, there are about 40 semi-permanent and 40 transitional kids living on the HOH compound. Many recovering from severe diseases or operations. How did Linda, a Haitian woman who contracted Tuberculosis as a child, end up with such incredible responsibility? 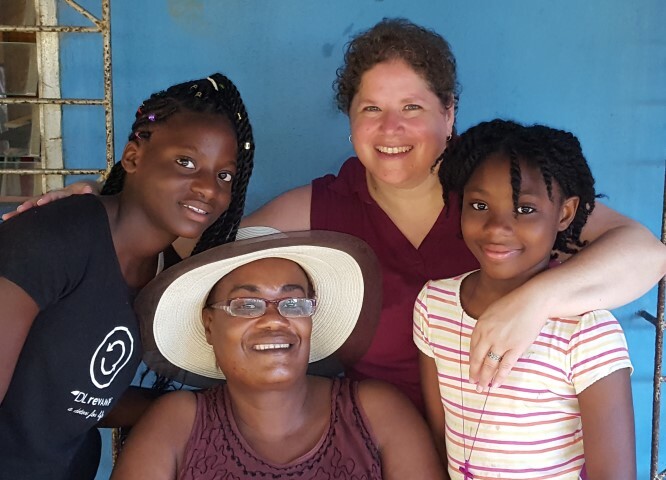 ER’s Jenny Reitz (pictured above, top) spent many years in Haiti helping run operations and supporting the children before returning to Canada. Today, Jenny raises funds, orders supplies and handles communications while returning to HOH as often as possible. Jenny shares Linda’s story below. Read on and be inspired. Linda was born into a happy, loving family. They lived in a small coastal village in Northern Haiti called Koko. Her family was large, and there were always many cousins around to play with. They had a lot of fertile land and many gardens. There was always much work to do, but they had fun doing it together. They would all work hard during the day, and then spend a lot of time playing together at night. When she was just 5 years old this peaceful, happy life took an unexpected and somewhat harsh twist. Linda became very sick. Her back began to hurt her a lot, and she became very weak. It took a lot of effort for Linda to walk at all. Her family took her to a doctor who told them he could not treat this illness, but he knew of a place that could. Because her family loved her a lot, they were willing to do anything to see her strong and healthy again, even if it meant traveling a long way to find the cure. They took Linda on a long trip that took many hours on very bad roads. Finally they arrived in a small village called La Pointe, where they found the HOH. They were told it was a place that took in children with a disease called Tuberculosis, which Linda had in her back. The children had to stay at the HOH for at least six months, taking medicine each day and lying in their beds. The family was not allowed to stay with the children. Although it was hard for them to leave Linda, her family knew they must in order for her to get better, so they returned to their home. This was a very hard time for Linda. She missed her family, especially her grandmother, a lot. Since Linda was so little everyone in the family spoiled her, but none more than her grandmother. Now at the HOH, she was just one of many kids, with no special attention like she received at home. Linda’s lifelong battle with TB allows her to connect with children with disabilities. Linda needed to have an operation on her back that could only be done at the Albert Schweitzer Hospital many hours away in a village called Deschapelles. After the operation, Linda returned to the HOH to lie on her back for the next six months. The months passed by slowly and Linda was so happy when her family came to pick her up. Because her treatment was not quite finished, the nurses at the HOH sent her home with some medicine that she was to take every day. At first, Linda received her medicine each day. But one day the bottle broke and the medicine spilled on the ground. Since Linda appeared to be better, no one worried. Everyone was very happy to have Linda home. Her grandmother missed her the most and took Linda to her house to live with her. It wasn’t that much different for Linda as all the families lived in the same yard and their grandmother always took a few children from each of the families to help with the expenses of raising children. Linda was happy to be with her grandmother and her cousins. The next seven years in Linda’s life were happy and memorable. When Linda got older, her grandmother decided to move into a larger city so all the cousins could go to a better school. They all packed up and moved into a big house in a city called Cap Haitian. Linda went to school during the week, but remembers the evenings and weekends as being full of fun with all her cousins. There were times, especially during summer vacations, when they had 30 cousins in the house all at the same time. As you can imagine, the house was a busy place. There was always someone who was playing jokes on the others. The boys were always fighting with the girls and Linda often was right there in the middle of this. When Grandma found out, everyone got disciplined. Grandma’s house was a place of order and discipline. Children learned to respect those who were older. Disrespect and disobedience were not allowed. Little did Linda know that she was being preparing her for her life’s work. Linda was a very good student in school and she studied a lot at home. When she was 13 years old, she was in the last class of elementary school. 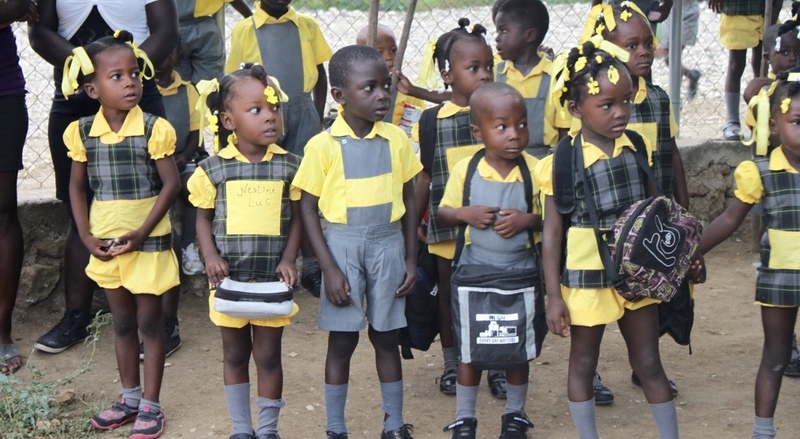 At that time in Haiti, this was a very hard year of school and many students fail and have to do the year over again. Linda was determined to study hard and pass it on her first try. One afternoon in October, Linda and some of her cousins went to see an aunt who had just had a baby girl. In order to get to the hospital they had to climb a small hill. By the time Linda got to the top she was tired and out of breath. After that day Linda and her family realized that she was losing her strength little by little. At first it was in the small things like walking up hills that they could see her weakness, but gradually it grew worse. Soon, Linda could not bend down and stand up without having something to hold onto. She became unable to pump the water the family needed. One frightening day, powerless to hold herself up any longer, Linda fell down. Unable to walk, yet bent on finishing the school year, Linda’s family took her to school in a car and then carried her up the stairs to her class. With sheer determination, Linda passed the school year despite her failing health. Thinking Linda just needed a rest and a change, her grandmother took her and the rest of the cousins back out to their country home for summer vacation. From June until December, Linda lay on her bed, unable to move around. Her family was beside themselves and didn’t know what to do. They did not realize that because Linda had not completed her TB treatment years ago, the sickness had returned and again took control of her body. Linda’s family tried local healing customs, but they were unsuccessful. Not knowing where to turn, Linda’s family took her to the doctor who had originally diagnosed her disease. The fact that this was the same illness as before disturbed her family a lot. They felt very responsible for her present condition. Hearing how the House of Hope in La Pointe could treat this illness, her family decided to take her there once again. They had no idea what changes this visit was about to bring in Linda’s life. Linda found herself back where she had been as a young child. She was too young to remember much from her first time at the HOH. Now, in the midst of her loneliness and pain, she experienced new love and compassion. The days still passed by slowly, though, as she was required to lie in bed all of the time. The loneliness she felt for her family was endured only by remembering and looking forward with anticipation to the visit that her mom made every two weeks. Three months after returning to the HOH, Linda learned she needed another operation on her back. It was everyone’s hope this operation would enable Linda to walk again. After the operation, the doctors informed Linda the disease had progressed too far. Linda was told she would never walk again. For any 14-year-old girl this news would come as a shock and it was no different for Linda. Her one solace became reading. She passed each day, month after month, year after year, lying on her back. One book that helped her was the life story of Joni Erickson Tada. If Joni could do all she does without the use of her legs and arms, then surely Linda could do a lot without using her legs. After lying flat in bed for 2½ years, Linda began learning to walk with body braces and crutches. With the help of dedicated nurses, a lot of hard work and determination, Linda eventually learned to walk using a walker. By this time Linda was 18 years old. Because of financial difficulties and a lack of personnel, the HOH had to close for a time. 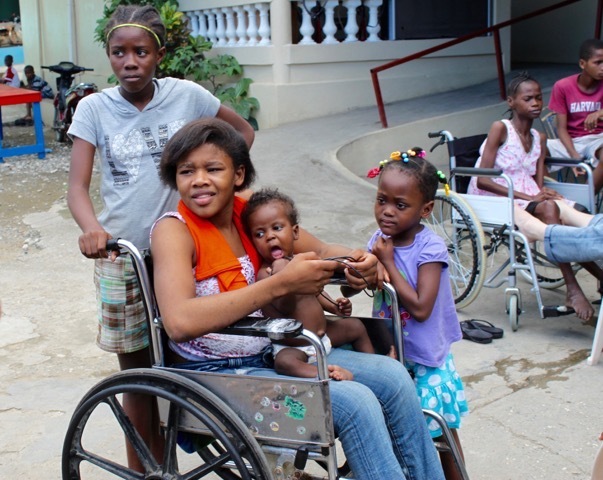 All the children were sent home, so Linda returned to Cap Haitian to be with her family. What should have been a happy time for everyone turned out to be a difficult time. She was permanently disabled and her family felt responsible. They doted on her for everything she needed, making her feel much more handicapped than she was. It didn’t take Linda long to realize that even though she loved her family dearly, she couldn’t stay there with them. Begging to go back to La Pointe, Linda’s Grandmother gave in to her wishes. She found a place where Linda could live while continuing her education in a nearby school. Linda applied herself once again to finish two more years of school. At the age of 20, Linda face more surgery and was admitted into the HOH, which had reopened in a room in the hospital. This time Linda only had to lie in bed for three months. Shortly after that, Gail Kealy, the woman responsible for the HOH at that time, asked Linda if she was interested in helping her. At first Linda wasn’t too thrilled with the idea. She had wanted to learn to work in the lab at the Hospital. Despite her plans, Linda willingly accepted the invitation. Little by little, Linda’s career desires changed. Before Gail left for furlough she made Linda her assistant. For a year, Linda took care of and ran the HOH. Upon returning from furlough, Gail asked Linda to train to become the director. For the next few years Gail worked closely with Linda. Fortunately, Linda’s journey had been preparing her all her life for this very work. Who better than someone who has been through sickness and disability to bring hope to other children experiencing these same things? It is Linda’s goal that no child leaves the HOH without finding the hope she has found. Linda has a heart full of love that spills onto every child who comes through the doors. No matter what job needs doing, Linda does it – cleaning toilets changing dirty diapers, cooking food, keeping the books or encouraging a child. It’s all in a day’s work for her and she does it all out of love for her kids. She has been “mom” to thousands of children and is a shining example of someone willing to pay the price required to care for kids. And it has cost her. She must live far from her family, seeing them rarely. She also had a chance to get married, but soon realized this was not in the plan for her at that time. Her family has wanted Linda to get a visa to move to the US. Even though this would make life easier for her, Linda sees Haiti and the HOH as being exactly where she belongs.